UK: Heathrow Airport first to Fingerprint! Millions of British airline passengers face mandatory Fingerprinting. LONDON: For the first time at any airport, the biometric checks will apply to all domestic passengers leaving the terminal, which will handle all British Airways flights to and from Heathrow. Millions of British airline passengers face mandatory fingerprinting before being allowed to board flights when Heathrow's Terminal 5 opens later this month. The controversial security measure is also set to be introduced at Gatwick, Manchester and Heathrow's Terminal 1, and many airline industry insiders believe fingerprinting could become universal at all UK airports within a few years. All four million domestic passengers who will pass through Terminal 5 annually after it opens on March 27 will have four fingerprints taken, as well as being photographed, when they check in. To ensure the passenger boarding the aircraft is the same person, the fingerprinting process will be repeated just before they board the aircraft and the photograph will be compared with their face. BAA, the company which owns Heathrow, insists the biometric information will be destroyed after 24 hours and will not be passed on to the police. It says the move is necessary to prevent criminals, terrorists and illegal immigrants trying to bypass border controls. The company said the move had been necessitated by the design of Terminal 5, where international and domestic passengers share the same lounges and public areas after they have checked in. Without the biometric checks, the company says, potential criminals and illegal immigrants arriving on international flights or in transit to another country could bypass border controls by swapping boarding passes with a domestic passenger who has already checked in. They could then board the domestic flight, where proof of identity is not currently required, fly on to another UK airport and leave without having to go through passport control. Most other airports avoid the problem by keeping international and domestic passengers separate at all times, but the mixed lounges exist at Gatwick, Manchester and Heathrow's Terminal 1. Gatwick and Manchester currently deal with the problem by photographing all passengers as they pass through security, and checking the picture against their face at the departure gate. Terminal 1 will soon introduce fingerprinting. Civil liberties campaigners have raised concerns about the possibility of security agencies trying to access the treasure trove of personal data in the future, adding that fingerprinting "will make innocent people feel like criminals". There are also fears that fingerprinting will add to the infamous "Heathrow hassle" which has led to some business travellers holding meetings in other countries because they want to avoid the sprawling, scruffy airport at any cost. Although fingerprinting is carried out at some foreign airports - most notably in the US - as part of immigration checks for international arrivals, Heathrow will be the first to fingerprint domestic passengers before they board their flights. Even if domestic passengers have a passport with them, they will still have to go through the biometric checks. Dr Gus Hosein, of the London School of Economics, an expert on the impact on technology on civil liberties, is one of the scheme's strongest critics. He said: "There is no other country in the world that requires passengers travelling on internal flights to be fingerprinted. BAA says the fingerprint data will be destroyed, but the records of who has travelled within the country will not be, and it will provide a rich source of data for the police and intelligence agencies. I grew up in a society where you only fingerprinted people if you suspected them of being criminals. By doing this they will make innocent people feel like criminals. There will also be a suspicion that this is the thin end of the wedge, that we are being softened up by making fingerprinting seem normal in the run-up to things like ID cards." Mr Hosein claimed automatic fingerprint technology is only 90 per cent accurate at best, and clear fingerprints can be difficult to obtain. Simon Davies, of campaign group Privacy International, suggested a photograph alone would be a perfectly adequate - and much cheaper - way of identifying passengers. "If they are photographing people anyway, why can't that be used as a means of identifying them, rather than taking biometric data?" he said. "It would probably be 50 times more reliable at a 50th of the cost. Fingerprint recognition technology is far from perfect, and the experience in the US has shown that the information can only be used retrospectively, not in real time, as it takes so long to match a fingerprint to the one held on the database. I think once again we are seeing the introduction of technology whose benefits are illusory." A spokesman for British Airways said: "We are supportive of the use of fingerprinting at Terminal 5. We need to make sure the right people get on the right flights and this will definitely help us to ease check-in and boarding procedures." BAA said the fingerprinting scheme was decided upon after consultation with the Home Office, and the company is keen to reassure passengers that their fingerprints will not be made available to any outside agency. A spokesman said: "The data will be destroyed after 24 hours. It will not be made available to the police or anyone else. This is purely for border and immigration control." International passengers will not be fingerprinted, as they must show a passport when they check in and before they board their flight. However, the fingerprinting of domestic passengers is expected to be the first step in the increasing use of the technology for people coming to and from Britain. Within the next few weeks BAA will announce plans for voluntary fingerprinting under a so-called "trusted traveller" scheme. Those willing to have their fingerprints and passport information stored would be able to bypass immigration queues by placing their finger on a scanner instead of waiting to have their passport checked. The move follows a trial of the technology, known as "miSense", at Heathrow last year. In the long term, fingerprinting could become even more widespread when the Government introduces tighter embarkation controls next year, which have not yet been specified but could range from having to show passports more often before boarding or using biometric checks. Officials began talks with the aviation industry within months of an alleged plot to blow up transatlantic airlines in August 2006. At the time, the Home Office refused to rule out the use of fingerprint and biometric checks as part of routine embarkation controls, and some industry insiders believe universal fingerprinting may be brought in when biometric passports are introduced in 2012. 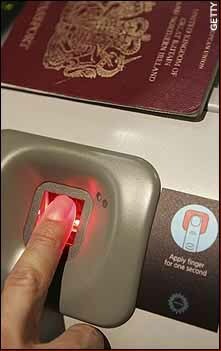 One option could be to routinely check fingerprints against the criminal record database - a step which is currently only taken when immigration officers have a reason to be suspicious. IRAN: Sir, we need your Fingerprints today!